Don't let your competitors get the better of you this year, advertise your details upon our very successful Corporate Chocolates from our confectionery department here at Calendar Lady Promotions. We have a wide range of different sweets and chocolates all ready to be branded up with your business details and company logo. 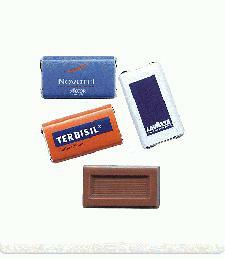 Other promotional and personalised items besides our Corporate Chocolates click here. View the full rage of Corporate Chocolates here. So for all your sweets and confectionery needs, visit our Personalised confectionery department. To find out more about our Corporate Chocolates click here and fill in the contact form and we'll get straight back to you.